I find joy in creating rich, meaningful worship services that touch on a range of themes and moods to serve the gathered community and our wider world. ​​Each piece of a worship service contributes to the experience of those who are present. Several elements I have written for services appear in the UUA's Worship Web resource. Examples of weddings and other rites & rituals can be found on this site. 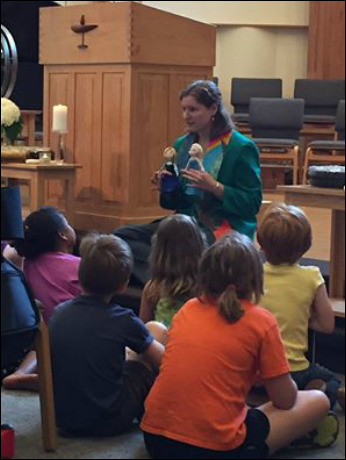 Using the characters of Frozen to talk with children (and grown-ups) about the greatest super power of all: love power (2016). The congregation I serve, Westside Unitarian Universalist Church, regularly posts sermons or reflections on YouTube (a volunteer labor of love). You can find some of my sermons on Westside's YouTube channel.